If you can walk you can ride. 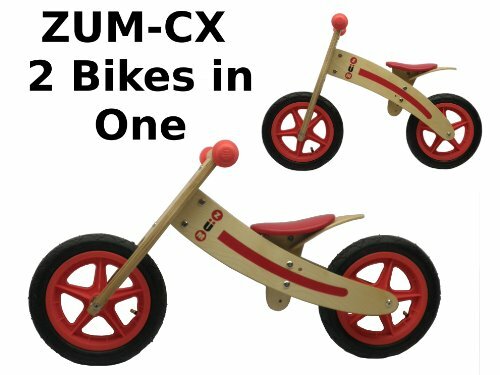 The ZUM-CX balance bike is two bikes in one. Balance Bikes by ZUM have no pedals and no training wheels. The ZUM Bike uses a foot to floor motion as a means of propulsion. The Bike is perfect for developing coordination and balance without the anxiety of training wheels. By learning balance first, the transition from the ZUM Balance Bike to a traditional geared bicycle with pedals is made VERY easy. This bike is great for children (ages 2-6) that are just learning to ride. No peddles, and no brakes make this one of the easiest bikes for young riders to get around on. These bikes are built for years of enjoyment. For more information, please visit www.zumbalancebike.com These bikes are constructed with the following features: 100% Clear Top Grade Birchwood Patented steering that helps prevent Jack knife accidents Rubber handgrips to protect little hands and the end of the handlebar from scuffs Sealed cartridge bearings for maintenance free, silent and smooth running wheels Rubber, air inflated, tires make for a smooth ride High grade steel fasteners Padded Vinyl Adjustable Seat Height - In the "Low Rider" mode, the seat can be adjusted from 12 inches to 14 inches. In the "Grown Up" mode, the seat can be adjusted from 15 inches to 17 inches, therefore making this bike very flexible. Non Toxic Lacquer Finish ASTM Certified - Sustainably Harvested Wood. If you have any questions about this product by ZÜM, contact us by completing and submitting the form below. If you are looking for a specif part number, please include it with your message. Hot Wheels Dynacraft Bike, Blue, 14"